My 1st series of model Bricklins were solid plastic (no interiors) and were offered from February 2002 until March 2004. In that time I built 49 examples. 17 were safety white, 10 were safety orange, 9 were safety red, 8 were safety green, 4 were safety suntan and 1 was customized in solid Viper red. Pictured below are examples of my 1st series models in each of the safety colors. The white model is actually not a 1st series resin model. It's the wooden prototype from which all copies are based! It still features the wheels & tires I first put on it back in 1982. If you look carefully, you'll see they don't match what's on all other Bricklin models. All Five Safety Colors Represented in this Lineup! 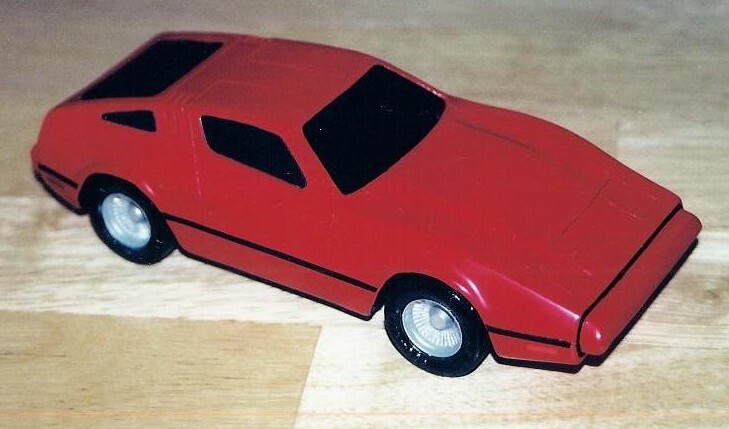 Model Bricklin #0030 - a one of a kind Viper Red Bricklin!